Since having a baby, I am a complete and utter impulse buyer - actually maybe I always had it in me.... But in my defence, these days rather than battle the change rooms with a pram and an 11 month old baby who just wants to pull everything off the hanger, I end up picking impulsive items from the shelf such as 67 dresses, 29 tops and 34 skirts with the intention of taking them all home to 'try' on at home and end up returning the ones that I don't like. Am I alone here?! My impulsive behaviour continues online where I have been sucked in one too many times by a good deal on a deal site (you know the ones - Scoopon, Spreets, Deal of the Day - need I go on?!) for a $49 colour, cut and blow-wave or $29 for a 3 course meal for two both in locations that quite frankly I know that I am never going to be able to get to in this lifetime. Sound familiar? Well if you are anything like me, then you are going to love the genius nature of a new website in the Australian market called Swappa. Swappa is an online marketplace that allows you to offload your unwanted, unused or nearly expired daily deals so they don't sit there wasted and you can get some of your hard earned back in your pocket - hooray!! It is also the place to head if you have missed out on a deal of a lifetime, as you might just find the deal being sold that you missed out on originally and probably at an even better price that the deal was in the first place - bonus!! So how do you find deals that you might want to sell? Super easy, simply head to the Swappa website and paste the word“Voucher” in your email search area, and look for any daily deals you may have forgotten about, or can’t use anymore. When you find one, simply email it to sell@swappa.com.auand Swappa will sell it for you. It’s that simple! Is it easy to sell? 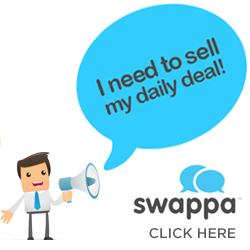 It really is, all you need to do is forward your daily deal confirmation through to sell@swappa.com.au, enter the sale price in the subject field and the folk at Swappa will do the rest! The Swappa website is super easy to navigate and Swappa also has a Facebook page that you can join if you want to keep tabs on some of the great offers as they pop up. More information on how it all works and any fees can be found right here. Disclaimer: This post has been sponsored by Swappa, the post and its' contents have been prepared for release by Utterly Organised.